Over the last decade governments all over have become highly interested in the activity of financial inclusion, and given the obvious economic benefits of inclusion, they are headed in the right direction, but are they taking the right path to do so? As I can see it, the government machinery has been busy creating new acquisition, and distribution channels such as NGOs, post offices, payment banks, banking correspondents, and PSBs (public sector banks) in rural areas to increase the reach of the formal financial services network for some years now. And in terms of increasing the number of formal accounts they have done a good job. But, if you take a closer look at the numbers and it becomes evident that even though the penetration of banking has grown, the utilization of services remains dismally low. For example, the case of Kenya, as seen in the chart below, the inclusion headcount stands at a proud 75%, but only some 15% of the population consume loan services provided by these institutions. This, in my opinion, is a failure of financial inclusion. 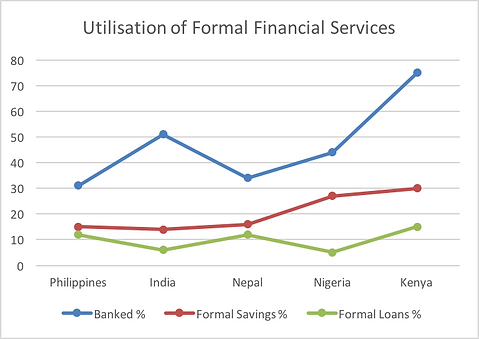 Despite the best intentions and efforts of the government, the traditional semi-formal/informal financial sector still prevails. The money-lender, the self-help group, at-home savings remain the staple sources of financial services for the semi-urban and rural consumer. I strongly believe that this is because the policyholders are competing with these traditional structures when they should be collaborating with them. Financial inclusion should be focussed on on-boarding these structures first, then focus on the consumers of these services. Rural financial ecosystems are still controlled by informal operators (not regulated by banking regulations – this includes moneylenders, rotating or accumulating savings, credit associations, self-help groups (SHG) and private companies), proving three types of financial products, simple credit facilities, basic saving account or a fixed deposit, and insurance. Maybe its time take stock of the situation and reboot financial inclusion with a different approach. For true financial inclusion to happen governments needs to include the semi-formal/informal sector rather than competing them. It is high time for the policymakers to revise their approach and not the compete with the existing rural ecosystem but to collaborate with them. Bring them together on a single platform and enable them with technology. The Solution: A central multi-tenant financial inclusion cloud. The focus needs to be on incentivizing the informal/semi-formal organizations to come together and form associations. Ensure these institutions understand the power of new technologies, and have access to them at an affordable cost. Configurable Rule Engine: A highly configurable rule engine is required so that each of these individual entities can map their businesses flows on the new platform without compromising on their business customs and traditions. Multi-Tenant: Each business entity will be a tenant on the platform and can use common universal services like notification, reports, mobile application if and as required. Shared resources will bring down the cost per user, and ensure business profitability. High Availability: Basic services can be made available 24×7, 365 days on mobile phones at par with big banks. Reliability: Increased operational efficiencies and transparency will increase customer trust and loyalty leading to the larger customer base. Data Security: Protecting sensitive data from breaches, theft or any other malicious activity by unauthorized users will lead to better compliance. Efficiency: Central data can be used as a repository to filter defaulting client which will lead to increased profitability. New Revenue Streams: New services like top-up, utility bill payments, ticketing, and remittances can be introduced which will act as a new revenue stream. Compliance: Central operations may lead to better compliance with regulations eventually leading to bigger credit supports from the government. The local financial ecosystem is still thriving and shows no signs of letting go because it has its inherent and inimitable strengths. Let us compliment and enhance them, not compete with them.